University of Oklahoma head men’s basketball coach Lon Kruger announced Wednesday the hiring of Carlin Hartman as assistant coach. Hartman joins the Sooners after spending the past two seasons as the associate head coach at Rice University. 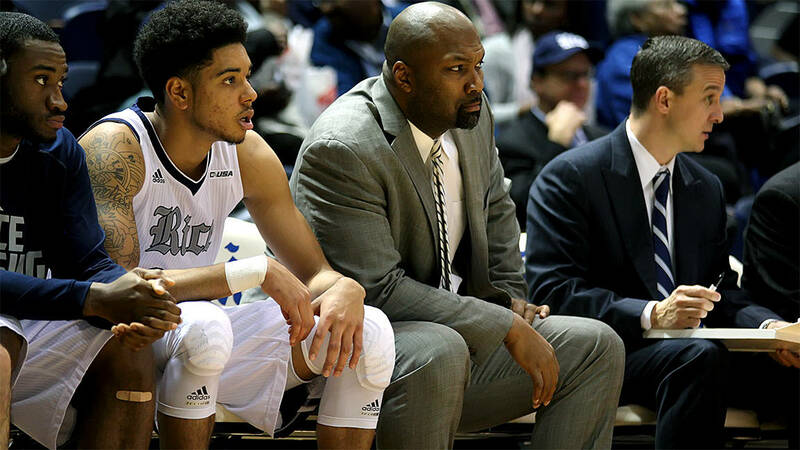 In the past two seasons working alongside head coach Mike Rhoades, Rice recorded a 15-21 record in Conference USA play. In the two seasons prior to the staff’s arrival, the school was 3-24 in conference games. Prior to Rice, he spent four seasons as associate head coach at Columbia, where in 2013-14 he helped guide the program to its most wins (21) since 1968 and to its first postseason appearance in more than 40 years. Preceding Columbia, he served on staffs at James Madison (2009-10), Centenary (2008-09), Richmond (2005-08), Louisiana-Lafayette (2004-05), Rice (2002-04; 1996-97) and McNeese State (1997-98). Hartman played collegiality at Tulane from 1990-94. He wrapped up his career ranked third at the school in career field goal percentage (.528), seventh in career steals (146) and 10th in scoring (1,180 points). He earned a degree in communications with a concentration in broadcast journalism in 1994. While at Tulane, he played in two of the Green Wave's three NCAA Tournament appearances. Hartman was All-Louisiana and honorable mention all-conference in 1993-94, honorable mention all-conference in 1992-93 and a member of the Metro Conference all-rookie team in 1990-91. The Rapid City Thrillers selected Hartman in the third round of the 1994 CBA Draft. The Hartmans have four children - Sydney, Kailyn, Tess and Joseph. With the addition of Hartman and previously-announced Kevin Kruger (hired on April 13), OU has filled out its staff for the 2016-17 season. Former assistants Steve Henson and Lew Hill departed for head coaching positions in April. The Sooners are coming off a 29-8 season in which they advanced to the school’s fifth Final Four. Senior guard Buddy Hield won the Oscar Robertson Trophy, Naismith Trophy and Wooden Award as the national player of the year.